We manufacture and supply one of the major aggregate testing equipment, the Los Angeles Abrasion Testing Machine. Los Angeles Abrasion Testing Machine has been designed as per IS: 10070. This Abrasion Testing Machine is used for the determination of the resistance to wear of crushed rocks and small size aggregates. The machine comprises a hollow cylinder that is mounted on a robust frame on ball bearings. A detachable shelf that spreads throughout the inner length of the drum catches the abrasive charge without allowing it to fall on the cover. 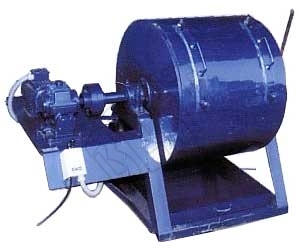 The drum is revolved at a speed of 30-33 RPM through an electric motor by a heavy duty reduction gear. Motor is apt for operation on 3 phase, 440 volts, and A.C. supply. The unit is offered with a tray for accumulation of the material with abrasive charge. It is also offered with 12 nos. hardened steel balls (Abrasive Charge) of 48mm dia.